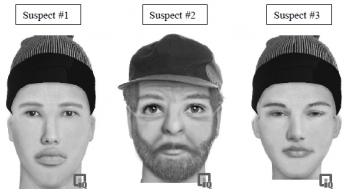 December 31, 2012 (Encinitas) – San Diego Sheriff asks residents countywide for help to identify three males who forcibly tried to kidnap an 18-year-old woman today in Encinitas. The suspects drove an older black pickup truck with orange horizontal stripes near the fenders and gardening gear in the truck bed. After she was pulled into the truck, the victim reportedly punched the driver and bit another suspect before fleeing to a nearby home for help. The driver is described as a heavy-set Hispanic man, age 30-40. A young Hispanic or white male with a thin build, possibly a juvenile, got out of the passenger side and ordered the victim to get in the truck, then pulled her in when she refused. Another passenger has a thin build and is believed to be Hispanic, age 25-35. The victim was walking northbound in the 500 block of Saxony Road in Encinitas at 1:30 p.m. today when she realized she was being followed and the abduction attempt occurred. Although this incident did not occur in East County, we have included this news due to the severity of the crime and potential threat to other victims, since these suspects are mobile and detailed descriptions are provided. If you have information on this crime, please contact Detective K. Stone at (760)966 3500 and refer to case # 12167152.